FORUM FOR STENOGRAPHERS: CONGRATULATIONS TO ALL O.M OF PRE-MATURE INCREMENT ON UP-GRADATION. CONGRATULATIONS TO ALL O.M OF PRE-MATURE INCREMENT ON UP-GRADATION. I am very thankful to the hero of the whole play of the upgradation of the posts of stenogrphers/steno typist/and pss,MR.KHALID RIAZ aur aus ki tamam team ko bee mubark bad deta hoon,Jis ki lengthy struggle ki waja say ham koo woo haq mil gia joo ham say ghazboon nain ghazab kia thaa,aurumeed ki jati hay kay ab depervied stenographers koo BPS-17 bhee zaroor mil jay gaa. May Allah give u and ur family long life and propserty. I dont have words which i can use for you. Congratulation to all colleagues. Khalid Riaz Sb. Ki koshish bilakhir rang lai he. Is notification ko ghaur se parha jae to ik confusion paida hota he. Kia 01.07.2013 k baad is ka arrear bhi miley ya nahi? Es ma koi confusion nahi ha...... Arrear mile ga per 2013-14 k budget ma. Congratulation to all colleagues and specially our Hero Mr. Khalid Riaz Sahib. KIA 2002 SAY LAIKAR 2013 TAK JO EMPLOYEES AIK SAY ZAID DAFA UPGRADE HO CHUKAY HEIN UNHEIN KITNI PRE-MATURE INCREMENTS MILEIN GI??? 1. Back date upgradation k liay case karoon ga.
2. computer allowance k liay koshish karoon ga.
3. Pre-mature increament k liay koshish karoon ga.
ab aap nay aik kam to kardia "Pre-mature increment wala baqi dono incentive kay baray mein kuch batana pasand farmaein gay k case kahan tak pohancha. Agar abhi tak baki dono points per koi kam nahein hua to mein aur meray dost Court Case k liay Contribution karnay kay liay Tayar hein. DEAR KHALID BHAI,JAOA,KAY BAD URZ KARRHAH HOON KAYAB AIS ORDERS KOO PROVINCIAL GOVT:APPROVE KARAY GEE TOO HAM PHER APPNAIN PARENTS DEPARTMENT KOO APPLICATIONS SUBMIT KARAIN GAAY AUR AUS KAY ORDER KAY BAD PHER SAMIUDDIN SAY BILL BANWAIN GAY AUR AG OFFICE KOO BEJAIN GAY YA YAY KAM AG OFFICE KHUD SIRINJAM DAY GAA, AIS KAY MUTALIQ AGAR WAZAHID KARDAIN TOO BOOTH MEHRABANI HOOGI. Thanks a lot Khan bhai and keep it up, we all praying for your long life and prosperity, it was possible just with your sheer courage and devotion, we must confess this. 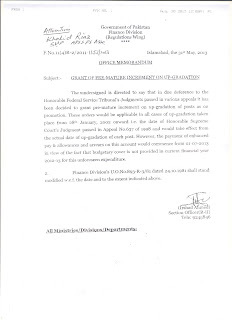 Congratulation to Mr. Khalid Riaz who is really deserve for issuance of this notification. No doubt Mr. Khalid Riaz is Hero of Pakistan for all Stenographers community. Asalam-o-Alikum to all my Colleagues and Especially Khalid Riaz Sb. next date fixed for hearing 19.06.2013 at Islamabad High Court. Khalid Riaz Sahib, what is the next date of hearing of deptrived stenographers titled Nasir Husnain before FST, Islamabad. First of all I congratulate all upgraded employees on pre-mature increment's notification. 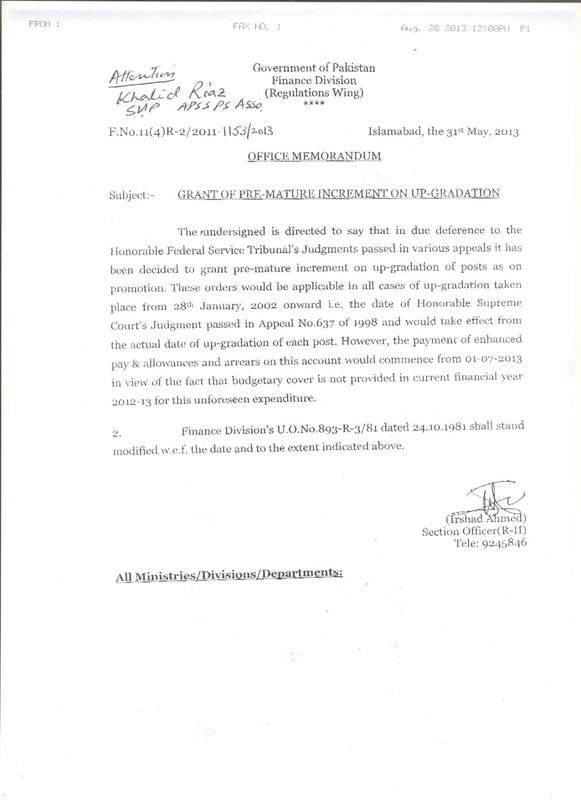 Original copy of notification of pre-mature increment of Federal has been received in Finance Department and has been put up. I hope, after budget, Punjab Notification will be issued. Thank you very much for your positive reply. I hope that the punjab government will give positive response. Pre-mature increment notification has not been endorsed to provinces. Please check. centre Stenographers during upgradation Please pray for him. Allah Talah Marhoom ko Jannat-ul-Firdous ma jaga ata farmay aur lawahqeen ko sabre-e-azeem ata farmay (Aamin). Mr. Sheikh Tariq Mehmood (Late) Stenographer was president District Sargodha. INNA LILLAHE WA INNA ILEHE RAJEOON. ALLAH TAALA MERHOOR TO JANNATUL FIRDOOS ME JAGA ATA FERMAE, AAMEEN. INNA LILLAHE WA INNA ILEHE RAJEOON. ALLAH TAALA MARHOOM KI UKHRAWI ZINDGI ASAD FARMAY AUR MARHOOM KO JANNAT-UL-FIRDOOS ME JAGA ATA FERMAE AUR LWAHKEEN KO SABR-E-AZEEM ATA FARMAY. AAMEEN. Copy of premature notification has been endorsed to all Provincial Chief Secretaries/Secretary Finance at Sr.No.17 of endorsement. Quaid-e-Azam ka Pakistan to jal raha tha, Dushmano na aaj (15.06.2013)ko Quaid ki Aakhri Aram Gah "Ziarat Residency" ko b jala dia. Afsos phir b hum Zinda Quom ha. Aj mera dil khoon k aansoo ro raha ha. Thanks for all the colleagues who pray for Sheik Tariq Stenographer (Late). I want to ask a question to Mr. Shafique Mughal that when will the government of punjab (Fnance Department) issue the notification of pre-mature increment is there any progress in this regard.